The technical definition of synesthesia is a state in which one sensory or cognitive pathway crosses over into another. It has also been described as a kind of hidden sense as many synesthetes are unaware that their sensory perceptions are unusual; or they may lack the terms in which to conceive of them. A synesthesic ability may be lying dormant due to its underuse, but remain as a latent sensory power. The term synesthesia comes from Ancient Greek, syn (“together”) and aisthesis (“sensation”). The discussion of synesthesia goes back to the beginnings of Greek philosophy when there was a debate over whether color, like pitch, could be considered a physical property of music. The scientific psychological diagnosis of synesthesia, as an involuntary condition, should be contrasted to the artistic concept as an active investigation into the crossover potential, or bleeding over, between different realms of sensory faculty and experience. Commonly reported instances of synesthesia include seeing individual numbers or letters in different colors, or of visual motion and flicker triggering different sounds. But the range of reported instances of synesthesia is so dispersed and divergent that it runs counter to the notion of “common sense”, which has it roots in Aristotle and his idea that behind the exterior senses there is a sensus communis. The phenomenon of synesthesia contradicts the rational ordering of the senses into a group of five distinct senses, each related to an individuated exterior organ. There has been a resurgence of interest In recent decades in synesthesia as a subject for study, but between the years 1930 and 1980 research into the area fell into a virtual oblivion, due to the rise of “Behaviourism” and the inability to measure and quantify subjective experience, which was distrusted. In recent years, Cretien van Campen has written frequently on synesthesia, often in relation to art and science. In his article “The Hidden Sense: On Becoming Aware of Synesthesia”, Campen writes that presumably everyone is born with a kind of synesthetic ability, but when we begin to learn cognitive skills and analytical thinking, somehow these perceptions subside into the background. They are considered deviant or abnormal, but yet remain uncodified in the system of representation. Campen points out that young children do not have the same sharp sense of boundary between the self and surrounding environment. But in the process of education one learns to distrust the senses, and the body, but to instead trust rational and logical thinking. The abstract self becomes separate from the environment and other individuals. Not only do we live in a language system in which the senses are ordered into five distinct categories, but, as Marshall McLuhan has written, since the Renaissance these senses have been in a hierarchical relation, with sight at the top; but not unbounded sight, but, rather, sight as constructed and experienced through linear and central perspective. Campen writes, “Synesthesia is hidden in the senses. To experience it consciously, you will have to explore and go looking for it.” To bring out and develop this synesthetic ability requires “exposing oneself to new sensations, expressing one’s synesthesia, not being ashamed [and] being able to experiment with it”. The city is a site with the potential for unbounded synesthesia when approached from an artistic perspective, in a kind of wandering. As a new form of nature, the variability contained within the city provides the opportunity for full immersion of the senses into a crossing over of states and language streams, once one has dislodged themselves from the subject position of busy utilitarian consumer bee. Construction in the city is invariably carried out in rational fashion, with utilitarian objectives, geared towards facilitating the most efficient capacity to produce and consume goods and services; and yet the city remains a contradiction with its tension between renewal and decay, and the ruptures created by historical discontinuities, shifts in power operations and structures. When a build first appears in its pristine condition it stands strictly positioned in a network of ascendent power. But as nature works its effect on the construction and the surrounding exterior environment changes, the meaning, and guarantee of its meaning, begins to fray, it’s utilitarian use begins to subside. Wayward signs are produced which cannot be traced back to referents. If one allows oneself to lose themselves in the sensory disarray, new perceptions and ways of experiencing can be uncovered. Walter Benjamin often chronicled subjective city life, including his early childhood in Berlin at the turn of the century. Benjamin’s writing on Berlin was inextricably connected to the nature and production of memory; as an exile in Paris during the Nazi era, he knew that what he was describing in his writing would soon otherwise be irretrievable. His writing, based on experience, but through the subjectivity of a child, at least as far as that could be approached from his position as an adult writer, aimed to use experience to short-circuit history, redeeming that which would be occluded in as much as the future contains the past. Benjamin believed that the imprint the city leaves on the child is in the form of images, it’s physical materiality or form. In the posthumously published “Berlin around 1900,” Benjamin wrote that “the man who merely makes an inventory of his findings, while failing to establish the exact location of where in today’s ground the ancient treasures have been stored up, cheats himself of his richest prize. 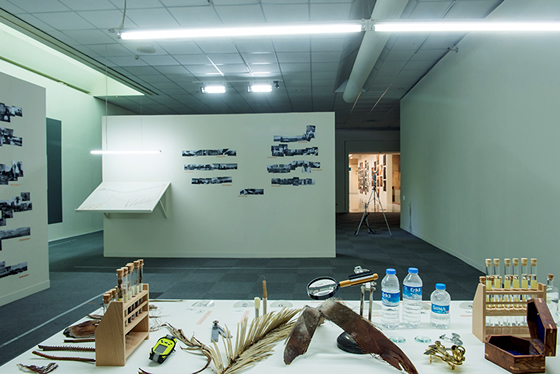 In this sense, for authentic memories, it is less important that the investigator report on them than he mark, quite precisely, the site where he gained possession of them.” Art taken from the approach is as much about the process of discovering these aberrant textures or aesthetics as it is in translating these sites to an audience. In terms of locating these deviant sensory perceptions, art for this kind provides a map to a hidden trajectory. At best it will stimulate the audience member into a full immersion of their own, a crossing over of the threshold of the self and distinct sensation into a becoming other, a becoming one with the environment, and the hidden sense of understanding the world through the body, to think through the body and the environment, beyond the the blinkered Vitruvian man of Western perspective. 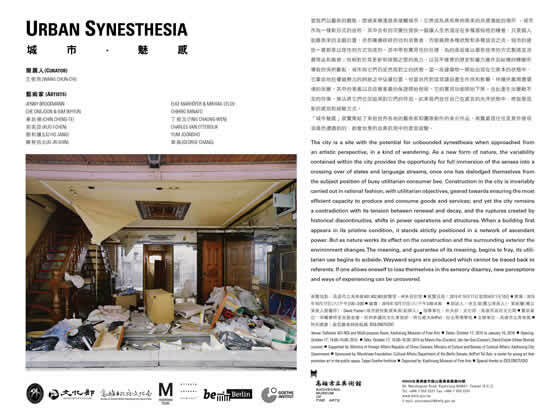 This essay was published on the exhibition guide book “Urban Synesthesia” at ARKI Gallery in Taipei. Curated by WANG Chun-chi, the exhibition features work drawn from various urban landscapes by the artists Che Onejoon 崔元準(KR), TING Chaong-Wen 丁昶文(TW), LIU Ho-Jang 劉和讓(TW), Chihiro Minato 港千尋(JP), Jenny Brockmann (D), Rumiko Hagiwara 荻原留美子(JP), and George Chang 章森(CN). The works deal with sensory experience in aberrant textures of the urban landscape, often in chance discoveries or encounters.